A Brief History of the Alpenrose Schuhplattler Verein In 1958 , after traveling weekly t o the Reading Liederkranz to learn dances , Joe Pichler and Frank Scheingraber started a group at the Lancaster Liederkranz called the Liederkranz Dancers. The group began with six dancers: Joe Pichler, Richard Wagner, Frank Scheingraber, Mary Ann Shreiner, Agnes “Sis” Schreiner, and Betty (Bertz) Weiss. New members were eventually added, and the group continued to learn more dances. A tailor in group, J o e Weiss, Sr., made skirts for the ladies, and the men purchased their lederhosen from Germany. In addition t o performing at the Lancaster Liederkranz, they continued to travel to Reading t o perform with the GTV Edelweiss Schuhplattlers and also t o Altoona to perform with the Almrausch Schuhplattlers, the Unter Uns. Early performances included the Knights of Columbus, the Philadelphia Swiss National Holiday Celebration, and on a WGAL TV local interest program. The original group remained active until 1962 when the military draft took some members into the service. Other members were beginning t o marry and start families, and the group officially dissolved in 1963. Original members, Tony Koenig and Frank Scheingraber went on to become members of the current group. The current dance group, the Alpenrose Schuhplattler Verein, was formed in 1973 by Vorplattler, Tony Koenig. Original members of the group were: Tony & Kitty Koenig, Lamar & Mary Swisher, Paul & Sis Meisenbach, Joe & Josie Jakob, Peter & Connie Knapp, Heinz & Anna Simon, and Bob & Jane Heagy. Their first performance wa s at St. Phillips Catholic Church. In 1988, Paul Stanavage wa s elected as Vorplattler of the group, and remains in that position today. In 2006, after countless hours of hard work and fund-raising efforts, the Alpenrose Schuhplattlers purchased their first flag (fahne). The flag was hand-made in Germany; and members: Paul & Barbi Stanavage, John Blank & Barbara Trostle, Bill & Barb Klein, and Russell & Elaine Kuhn traveled t o Germany to bring t h e flag back to our club. The flag, considered a visual representation of the Verein, was dedicated at the Schuhplattler’s Fahnenweihe, which was held at the Lancaster Host Resort, June 30-July 2. 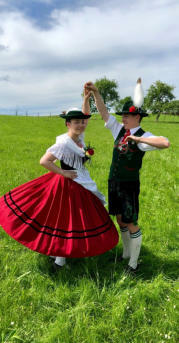 The Alpenrose Schuhplatter dancers continue t o uphold the tradition folk dancing which originates from Bavaria , Germany and the Austrian Tyrol.